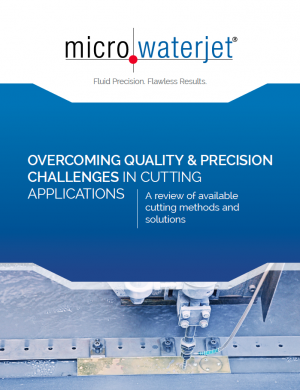 As one of the most innovative technologies on the market for precision cutting of parts and components, Micro Waterjet has presented a leading-edge alternative for clients struggling with other cutting methods. Today, however, the company has taken their problem-solving approach a step further by publishing a comprehensive comparison guide that details the strengths and weaknesses of all major available cutting methods. The digital white paper covers not only the Micro Waterjet technology, which is capable of delivering .010 mm accuracy across a wide range of materials with little or no burr and zero heat deformation – but also reviews other common cutting methods such as wire EDM and laser, among others. For a copy of this White Paper, please click HERE. Contact us today to start the conversation and get a custom quote.